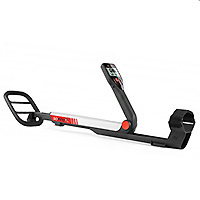 As a newbie, I wanted an inexpensive, light (under 3 lbs with batteries), but well-made metal detector. 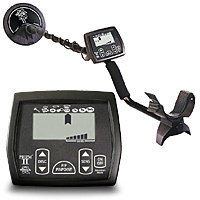 I did not want to invest a lot of money, in case I did not like metal detecting. After receiving a $50 off coupon from Whites, I decided to go to the local hardware store, which had a store-wide sale, and take a look at the Whites Detectors. With sale and coupon I ended up purchasing the Prism II for under $150.00, though I could have purchased a Prizm IV for around $300.00, I feel I didn't want to spend that kind of money at this time. The assembly of the unit is easy. Directions were clear and easy to follow. One thing I noticed in the directions is that is doesnt show where the Headphone jack is. It is located on the side of the box, there is a black pullout snap cover protecting the opening. The unit is well balanced also, which is very important at the end of a long day. It is not "top" or bottom" heavy and the arm cup is comfortable. This unit is truly an ON and GO machine. Simply turn it on and you can go hunting, using factory settings for discrimination (factory presets eliminate iron and foil and standard sensivity is set) I found .56 in change including 2 clad quarters at 5 inches in my first 30 minutes at a local park. While the Prizm II lacks a depth indicator ,I still dont feel that for a beginner, a depth indicator (Prizm III) is necessary and I would rather save the $100 and spend it on books or gasoline, or use to buy a better dectector if I get hooked on the hobby, so that is why I didn't buy a Prizm III or IV. 2nd day out at a local man-made beach I found 13 coins (no quarters), 2 hot wheels, fishing sinkers, an old key and over 30 pull tabs. I dug all tab indications. The unit detect via motion sweeping, unless in pinpoint mode. When a target it indicated you get a distinct BEEP. To verify it is a true target, White suggests repeated BEEPS in both the forward and reverse swing to indicate repeatability of the signal. I found this works well. I feel this unit will go 6-8 inches deep no problem, though i didnt go that deep for my finds as they were all shallower. The Pinpointing mode is very good, in the center of the coil, making it easy use. Once a person understands what discrimation is and does and how it works (read as many books as you can on the subject), one can adjust it to suit his/her tastes. The control is easy to use. The sensitivity control is easy to use also, if you need to adjust it. The digital display shows the type of treasure that is most likely to be dug up. At the time , as a newbie, I didnt realize that rings could and will likely show up in the tab range, but never the matter, i didnt miss any jewelry, because I dug all signals. Unfortunatly, I had only 2 days to use the Prizm II before winter snow storm that totalled 17 inches of snow over a 3 day period, sub zero temperatures, so I am afraid my hunting days are over until spring. I am very well satisfied with this unit, and I am hooked on the hobby. I will always keep this unit as a spare, if I decide to go with an update next year. I highly recommend this unit, especially if you can purchase it for between 150-$200.00.